All about that lace. This Wireless Lace Bralette features a plunging neckline, pull-on design, and longline silhouette. Our 30 Day Fit Guarantee Lingerie is personal—you deserve to shop with confidence. If you’re not completely happy with your purchase, you have 30 days to return any item for free. As a bigger girl, it has been extremely difficult to find a bralette that was supportive but still pretty. This is the best of all worlds. I'm back on the site to order in more colors. I'm a 38DD/DDD and ordered a 2XL- the fit is perfect. So pretty! 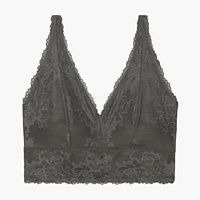 I was a little hesitant to purchase this bralette because I was worried the wireless lace wouldn't give me any support. No need to fret. The straps are thick and adjustable. No sideboob hanging out. Great support. I want one in every color now. Where so I start? I am a plus size woman. With that being said it is extremely hard to find a plus size bralette that fits, feels and looks right. Rihanna nailed it. Baby when I tell you this bra had my breast sitting up high and perky. I orders this item with low expectations and was pleasantly surprised to see how much detail and quality material was put into a plus size garment. I immediately got on the phone with two people and told them to buy or I would buy for them.